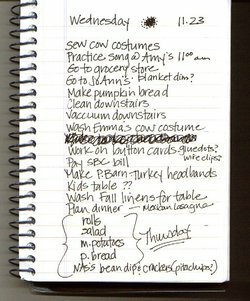 My "Wednesday List" is bigger than Wednesday. It has been a crazy morning of trying to prepare for tomorrow’s Thanksgiving celebration. For starters, the cousins are singing a Laurie Berkner song (I love my rooster, my rooster loves me….) for a little meal/dessert intermission. Each one is dressing up as a different animal, as the song goes, and Emma is a cow. This morning, I sat down at my sewing machine to whip up a little cow hood for her and the needle is completely jammed. It makes about two stitches and then is so tight, I can’t even pull the fabric out from under the needle. So, instead I spent the morning, handstitching ears and pompom trim onto a plastic headband. And of course, I agreed to make a costume for one of emma’s cousins as well! I think she looks more like a cat now, than a cow, so I’m going to have to come up with some type of udder contraption to instill the cow theme to her audience (grandma, dad, aunt’s and uncle’s). Mary has been in an ultra-clingy phase lately which is exhausting. It means either washing dishes and picking up toys (and stitching cow ears) with a screaming baby tugging at my pants, or with a happy baby sitting on my hip. This is all making me a little crazy. I’m wondering if she might be getting sick. I’ve also been spending way too much time on a design for cards to try to sell my buttons. I’m so excited about projects with them, and I thought selling a few might defer the cost of my next class a bit. Of course, I’m spending too much time on the things that aren’t essentials–like the Five Day Sale at JoAnn fabrics and button cards. But I need a little break from my messy house and broken sewing machine. 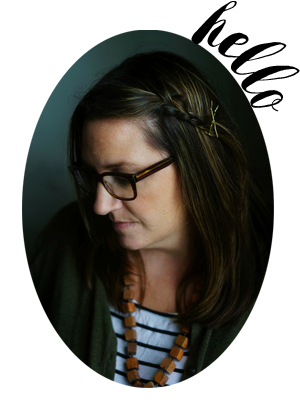 But in the spirit of thankfulness, I am thankful for the many blessings that God has provided for our family–a warm home, loving family, healthy children, opportunities for creativity, and blogging friends. Wishing a blessed Thanksgiving to you all…cheers. you are one busy girl! I am tired just reading that list of yours. but it all sounds like great fun, of course. ezra does that ultra-clingy thing and it drives me nuts. today, I tried to bake ward a birthday cake with him attached to my hip (and ava helping) and I do NOT recommend this. 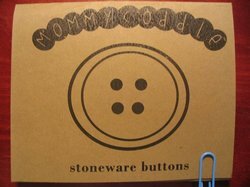 LOVE the idea of you selling your stoneware buttons and adore the packaging…! You’re a busy lady. The button cards are really cute. What a great idea to have the kids sing a song. When mine are older I’m going to have them be entertainment too. Have a super Thanksgiving. Americans have so many celebrations. We don’t have half as many. I don’t think I could keep up with it. 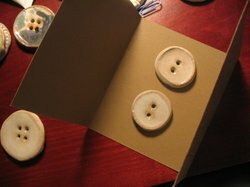 What about sewing the buttons to the card with thick wool. use that same colour wool to wrap a couple of times around the card with a tiny little tag. Happy thanksgiving! 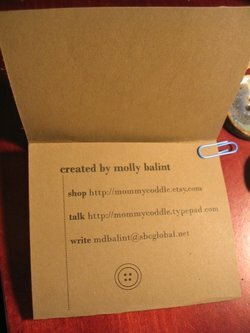 That is so great you are going to sell your buttons! 🙂 Owen has been super clingy with his dad lately. I guess they just go through these times? ooh ooh, pick me pick me!!!! I wanna buy some of those buttons! Love the packaging!